When Steve Alford was chosen to replace longtime coach Ben Howland in April 2013, the hire didn’t exactly have UCLA fans jumping for joy. Howland, after all, had taken the Bruins to three straight Final Fours in the past decade and was fresh off a Pac-12 regular-season title. Alford, meanwhile, had reached the Sweet 16 just once as a coach — 14 years prior, with upstart Southwest Missouri State. But when the dust had settled somewhat and Alford’s first UCLA team actually took the court, winning soothed most of those concerns. His players quickly bought in, and despite a rather uninspiring run through a less-than-intimidating non-conference schedule, the Bruins’ up-tempo, high-powered offense quickly became a force to be reckoned with in March, when it mattered most. After dropping its worst game of the season to Washington State in the regular-season finale, UCLA burned through the Pac-12 Tournament like it had something to prove, pulling off a fantastic, last-minute victory over Arizona in the title game. That momentum carried the Bruins all the way to the Sweet 16 for the first time since 2008. Alford will have to do some serious remodeling to repeat those results during the 2014-15 season, with four of five starters and his top bench option gone. But with a top-flight recruiting class coming in and some talent already in place, Alford might be in position to prove his doubters wrong again in Year 2. 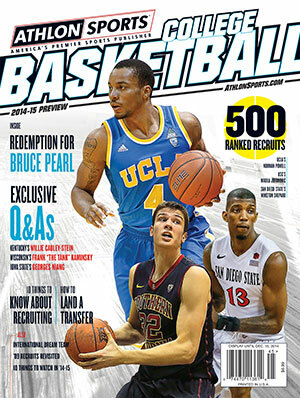 The UCLA edition is one of dozens available in our online store and on newsstands everywhere now. Twins Travis and David Wear never quite provided the post presence that UCLA needed to be taken seriously down low, and despite high expectations, one-time top recruit Tony Parker has yet to pan out as the Bruins might’ve hoped. But after a year of dealing with a paper-thin frontcourt, Alford and his staff made it a point to get bigger and stronger down low. UCLA added four frontcourt players in this year’s recruiting class, highlighted by five-star forward Kevon Looney, and should finally have the versatility to play inside and out. That should mean a very different-looking offense and, likely, an increased role for Parker, whom Alford says he’s counting on to make the most significant improvement of any player on the roster. Whoever it is filling the void, though, UCLA will have to find some way to replace the rebounding prowess of point forward Kyle Anderson and wing Jordan Adams, who combined for almost half the Bruins’ rebounding output last season. Losing Anderson, Adams, and enigmatic one-and-done Zach LaVine — all three of whom were first-round NBA Draft picks — could make for an insurmountable blow to UCLA’s backcourt, especially after Alford and his staff missed out on getting guard help in this year’s recruiting class. But Alford has the utmost confidence in his son, Bryce, to take over Anderson’s spot at point guard, repeatedly referring to him “a coach on the floor” this offseason. And in redshirt freshman Isaac Hamilton, who sat out last season, UCLA will have a consummate five-star talent to play next to him and take on some of the scoring load. The pair of young guards will have Norman Powell to lean on, at least. The senior guard exploded offensively toward the end of last season, averaging 14 points per game during the postseason. Losing its talented core from last season will probably hurt UCLA early on in 2014-15, as it tries to find the same rhythm it harnessed during last year’s postseason run. The Bruins will also have a tougher road to travel, with a beefed-up non-conference schedule that includes Kentucky and Gonzaga. But assuming Alford follows through on his promise to adjust to a very different roster, UCLA should have the talent to be a player in the Pac-12 again this season. Unseating a top contender like Arizona might be too much to ask, but if Hamilton and Looney come through on their five-star potential, and the younger Alford can keep UCLA’s up-tempo offense on track, then the Bruins could make a splash come March. Without much size last season, Steve Alford made it a point to shore up the frontcourt with his first full recruiting haul, adding an impressive four-man class, all of whom stand 6-9 or taller. The gem among them should be Kevon Looney, a five-star talent who dominates the boards. Seven-footer Thomas Welsh and versatile forward Jonah Bolden should help bolster depth, while Gyorgy Goloman will take time to develop.